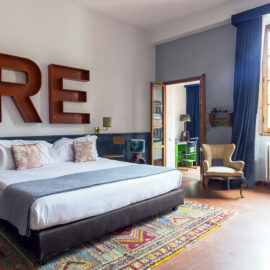 Every room at SoprArno has a different look and feel, each one is personalised in its own way for a quirky and individual experience. 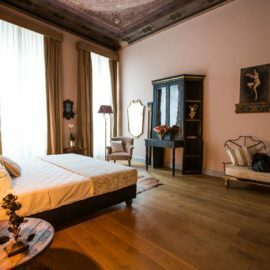 The 13 rooms vary in décor, size and views from the windows – seven open up onto an internal courtyard, six look onto the majestic Via Maggio. All rooms are stocked with a kettle and espresso machine, HD TV, free wi–fi, slippers and C.O. Bigelow bath products. Some suites have a freestanding bathtub in the bedroom as well as a shower in the bathroom.